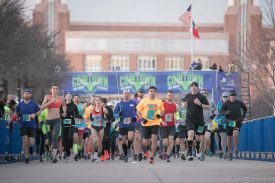 In addition to announcing registration, the Cowtown, with a nod to race weekend falling on leap year, is offering a 4-person relay on the 26.2-mile marathon course. Teams of four may enter this new race option at a current rate of $50 per team member. Prices do increase as race day approaches. Legs are equidistant and will be timed. Relay participants will have an option to purchase marathon finisher attire and will experience all the same excitement for crossing the line. Transportation will be coordinated for parts of the relay and organizers are thrilled to revive this race offering. From now on, the Cowtown features seven (7) race options and a two-day Health & Fitness Expo. The Ultra Marathon (50K), the Marathon (26.2 miles), the Marathon Relay, Half Marathon (13.1 miles), 10K, Adults 5K, and Kids 5K. The Marathon Relay is eligible for the Cowtown Challenge. Running both a K-distance as an individual on Saturday and then in the team relay on Sunday will earn runners an additional medal. There are new medals for all the races in 2020 as 2019 was the last year in a three-year series. The 2020 medals are sure to be coveted collector items. The Cowtown Marathon is a city-wide event that takes 4,000 volunteers and welcomes visitors from around the world. In 2019, we welcomed participants from 49 states and 11 different countries with ~22,500 registered participants. The Cowtown benefits C.A.L.F. – Children’s Activities for Life and Fitness. This program annually provides physical education and equipment to children in 17 school districts surrounding the Metroplex. We believe a fit and active child will adopt healthy, life-long habits. After ten years, C.A.L.F. has supported more than 30,000 children in pursuit of health.